Paragon knows everything there is about hard drive management. Paragon Hard Disk Manager 12 Suite proves just that, as they continue to push out annual updates to their premium software that never disappoints. This time around, Paragon has bundled more than 20 tools into a single arsenal that ought to make even the most complex hard drive management a cinch. I’ve personally used other software by Paragon and I can’t say enough about the functionality of their products. At $49.95 per license, Paragon Hard Drive Manager 12 Suite for Windows may be out of reach for some of you. 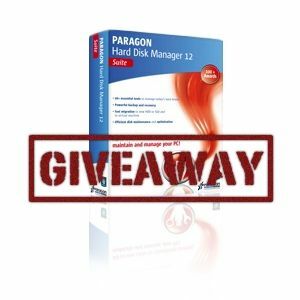 Through this giveaway, we’ll be dishing out 25 copies of the ultimate disk management and partitioning tool, Paragon Hard Disk Manager 12 Suite retailing at $1250, for free! If you’re interested, read through this review of the software and learn more about the participation details of this giveaway near the bottom of the post. As you can see in the screenshot above, this software is very extensive and has a lot of features. As an advanced user, you’ll probably be even more overwhelmed by what this suite has to offer. Those of you brave enough to use the advanced interface, rather than the default “express mode,” really get a look inside at the guts of your hard drive. Everything you need to manage, manipulate, and tweak your drives is right before you. While the sheer depth in each feature is a little too much to dig into specifically in this review, let me show you how easy it is to perform a single, important operation using the simple interface that Paragon provides. One of the many tools available to you in this suite is Paragon Total Defrag 12. Though it’s probably often overlooked, as most novice users are possibly familiar and satisfied with disk fragmentation provided by Windows, this tool offers a ton of functionality. Within Total Defrag, you’re able to view advanced analysis of your disks, defragment specific partitions, defragment the MFT, test the disk surface and file integrity, and more. As the screenshot shows, everything is very point-and-click. Paragon makes it really difficult to get lost and confused along the way, even for those with the most elementary understanding of disk management. Should you need any help, every single tool bundled into this suite comes with a very extensive index of material that will help you along the way. Here is a rundown on everything that will be available to you in this suite, taken straight from the software’s interface itself. The partitioning options are the deepest, as they should be. You’re able to manipulate, section, split, merge, format, resize, and delete as you please. This suite stands high over other disk management tools as it also acts as an all-in-one disk backup and recovery agent. One of the coolest features of HDM 12 is the ability to migrate your operating system from your HDD to a SSD. HDM 12 can also help you keep your disk healthy, adding time to its life. The virtualization options are also to be looked into. Want to emulate your computer on another, within VirtualBox? Get a P2V copy and you can do just that. If you’re dual-booting operating systems, Paragon makes it incredibly easy to manage the two. Using the tools included in this suite, you’re able to look at managing your disk and keeping it healthy in a whole new way. When you’ve got a piece of software that lets you play with every element of your disk and it’s point-and-click, you’ve got no reason not to be proactive and take care of your disks for years to come. If you decide to outright buy the software, it’ll pay itself off within a year. We’ll only be giving away 25 copies of Paragon Hard Disk Manager 12 Suite, so make sure that you try to get your hands on them while they last! You won’t regret it and your hard drive will definitely thank you. Congratulations! If you were selected as a winner, you would have received your license via email from jackson@makeuseof.com. If you require any assistance, please get in touch with jackson@makeuseof.com before May 14. Enquires beyond this date will not be entertained. This giveaway begins now and ends Friday, May 4th. The winners will be selected at random and informed via email. Explore more about: Disk Partition, Hard Drive, MakeUseOf Giveaway. I don't really like third party Hard Disk managers. They're not something I would trust. Why would you not trust them, Kelvin? Do you use native Windows tools to manage your hard disk, then? I have to say I do, due to the fact that native Windows tools seem more reliable and less capable of bugging up. I'd rather use an integrated solution rather than a third party one. It's something more instinctual for me - To rather not use third party applications to modify my system-level items. Good point. On the other hand, third-party applications offer many more features. For example you can move space from one partition to another in ways that the native Windows partition manager does not allow you to. Also, tools like those from Paragon have been around for very long and are highly reliable. But of course if you don't need additional features, the native applications are good enough. Another advantage is that you save hard drive space, registry clutter, and in some cases RAM by not installing third-party apps. I am in. Good Luck guys. I'd love to win a copy of this software! Paragon's disk suite is one of the few I've always trusted, because quite frankly they're robust, easy to use and are extremely precise and accurate. Thank you MakeUseOf for this opportunity, and the review is great as well. Good luck to all of us who enter! This would be a really great and useful program to win. It loads a lot of functions into one program. Come on Lady Luck. Hope to get one license! Thank you! Isn't all this functionality provided by linux live cds like gparted or partition magic. besides i can already do much of these in windows 7. This is great. I'd love to win. 1 husband, 1 grandchild, 1 adult child at home, 5 miniature dachshunds - I need this! Awesome...all my disk utilities in one place! Really a great hdd manager which could perform all task in one which is COOL! Wonderful giveaway. Please allow me to enter the contest. I have tweeted (https://twitter.com/#!/clarkeac/status/197137675688476672), liked and commented. I have 9 hard drives on my main system (5 hot swapable). I could use software that would help me keep in control. Thanks for a chance to win an outstanding software. Really great software for HDD! Really great contest! Thank you for this chance!!! Regards. I hope I get to win something in my life. Hope I will win this.